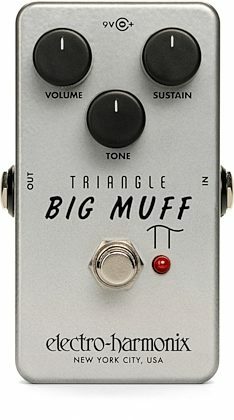 The Electro-Harmonix Triangle Big Muff is a faithful re-creation of the original circa 1969 Big Muff. 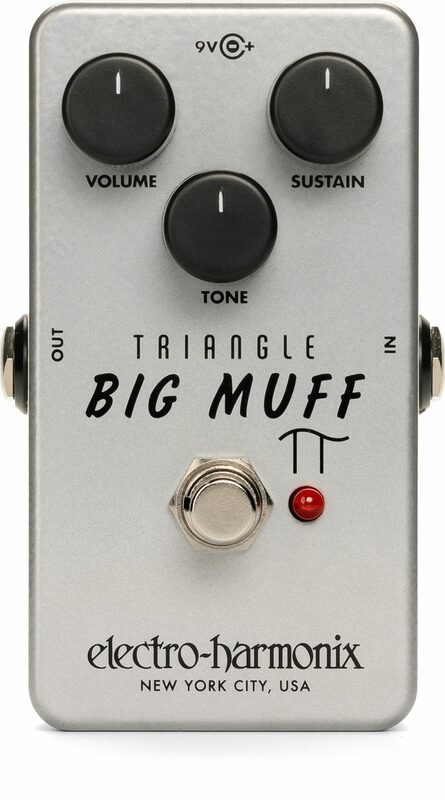 Named the Triangle Big Muff because of the layout of its Volume, Sustain and Tone controls -- it's the one that started it all. This review has been selected by our experts as particularly helpful. "Maximum Overdrive"
Sound: The sound is very reminiscent of the 60's-70's era fuzz. It has a very good high end boost when the tone is fully up almost a ringmod feel if you will. I like it set to about 3/4 o'clock personally as it makes your tone sharp, without sounding like a tin can being sawed in half. It is very warm on full sustain giving a massive glow to your leads with a neck pickup engaged. It does not sound as awesome with the tone on the 6-12 o'clock settings as it makes a very bassy tone in that aspect, but I myself do not like a lot of bass in my tone so I would chalk up that up to personal distaste. Other then that it is great for blues, hard rock, super awesome for lead playing, and it also has a very doom metal sound to it as well. If you are looking for more of a 90's fuzz sound a'la The Smashing Pumpkins or Melvins I reccomend the Od muff reissue it has a more mid range to low frequency, and does not favor the high end like the triangle. Feature: The features are all standard. I would have like it to have a gain contol on it, but the sustain seems to act as one on its own. I reccomend tuning it down if yoyr finding your fuzz to be too fizzy. Ease of Use: This product is very easy to use. If you like an aggressive Treble ended fuzz this pedal is yoyr friend. It only took me 5 minutes to get the sound I wanted. Quality: It is made very well. All American, no loose parts, and the knobs are on very snug. The only thing cosmetically is that it is a bit boring in terms of color/design, but it makes up for it with the color it adds to ones tonality so it really is no matter. Value: Yes very worth it. Manufacturer Support: EHX's reputation I believe speaks for itself. The Wow Factor: I dont think I cam ever stop using this pedal. It is now my essential fuzz, and will most likley what I use for all the rest my years to come. I would not want to write without it now. Overall: A very powerful fuzz.